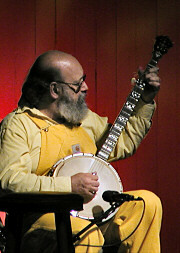 Paul Prestopino moves from piano to the harmonica, banjo, mandolin, Dobro, recorder, guitars and bass. He is a member of the dance band, Hold the Mustard and has accompanied the Chad Mitchell Trio (for over 50 years), John Denver and Peter, Paul and Mary. Posted on October 21, 2013, in Baldwin's Station and tagged Paul Prestopino, Side by Side, singer/songwriter. Bookmark the permalink. Comments Off on Paul Prestopino to accompany Side By Side at Baldwin’s Station.